My good buddy, Jeff Aragaki, of Aracom Amplifiers came over to the house to drop off some gear for me to evaluate: a ’59 Les Paul replica (I’ll have a review of that guitar in a few days after I’ve played it a bit) and a new Jensen 1 X 12 speaker. In turn, I was going to give him a pair of Groove Tubes Gold Series 6L6’s (GREAT f-in’ tubes). After that, we’d go get some lunch and catch up as we haven’t hung out in awhile. We ended up going to a great Japanese curry place in downtown Los Altos. After lunch, we got in my car and Jeff said, “It’s too bad there’s not a guitar shop around here.” I of course know where all the shops are and replied, “You know, there’s one that’s about 10 minutes away. Let’s go there.” So I took him to Gryphon Stringed Instruments in Palo Alto. It’s a high-end acoustic guitar shop that has been around for years, and in addition to having a great stock of Martin, Collings and other high-end acoustics, plus a limited selection of electric guitars and some VERY nice vintage stuff including a 1960 Telecaster for $17,500, they have high-end picks. It’s the place where I discovered Red Bear Trading pics. I did have a motive for going there as I needed a good stage stand for my guitar, and Gryphon carries the very awesome Hamilton guitar stands. After my guitar almost got knocked over by a gust of wind at my gig yesterday, I knew I needed to get a good stand, and it was a good excuse to go there with Jeff so we could jam for a bit as well. So the sales guy rang up my stand, and then I made the mistake of looking into the case to see what picks they had. Mistake. 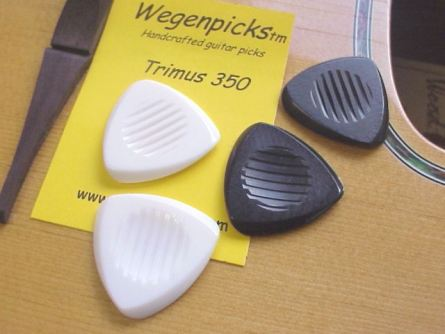 I didn’t know they carried Wegen picks, and there they were: Three cases full of ’em. I couldn’t resist. I had to try them out. Now I had learned of Wegen picks from various forums, but never had the occasion to play one until today. So the verdict? Well, I liked the material enough as I ended up getting the Trimus 350, which is 3.5mm thick. That’s just a bit thinner than my V-Picks Snake. So what’s so special about this pick that I was willing to drop $20 on it? First of all, it has a different feel than V-Picks or the Red Bear picks. The material feels softer than either the Red Bear Tortis and the V-Picks acrylic, which makes for a nice, smooth tone. The points are beveled, so you do get a snap that brings out the highs. Now Wegen claims that the material feels a lot like real tortoise shell. I’ve felt real tortoise shell, and this feels nothing like it. But that’s not a bad thing. What really turned me on about this pick is really the feel. It’s not as smooth in feel as either the V-Picks or the Red Bear, which have glass-like finishes. In contrast, the Wegen pick has a bit of a texture. But amazingly enough, that doesn’t translate to stickiness on the strings. Whatever Wegen I tested, it just glided over the strings. Another nice feature of the Wegen picks I tested were the grooves cut into the body of the pick. Add to that a depression in the body, and what you’ve got is a pick that you can really hold onto! I chose the Trimus 350 because I like the shape – it is very similar to my V-Picks Snake and my Red Bear B-Style Gypsy Jazz. It’s also thinner than both – not by much – but still just a bit thinner. But Wegen has a lot of different picks. If you get a chance, check one out!